Have A Craving For Some Fries? These Sweet Potato Fries Will Hit The Spot Without The Calories! When it comes to grilling season there is one side dish you can be sure will make an appearance at every bbq and family function….the french fry! There is something about this king of comfort food that makes even the grumpiest of people smile. But let's face it while we love fries the calories are not something we want to consume. Thankfully we found a tasty solution for this next recipe! Most of enjoy french fries with our hamburgers, chicken strips or just about any other meal. They are crispy, satisfying and oh so good. However, more and more people are passing up regular fries in favor of sweet potato fries. Not only are they just as crispy but they have a sweetness to them that makes them so irresistible. Many people opt for this slightly healthier version in restaurants yet when they get home and attempt to make them on their own they turn out…less than stellar. If this is the case, then you need to try this amazing recipe for baked sweet potato fries. Your fries will turn out so crispy and fantastic and it is so easy. All you have to do is combine your sweet potato with some salt and a few other ingredients you may already have in the kitchen and your sweet potatoes will be out of this world. 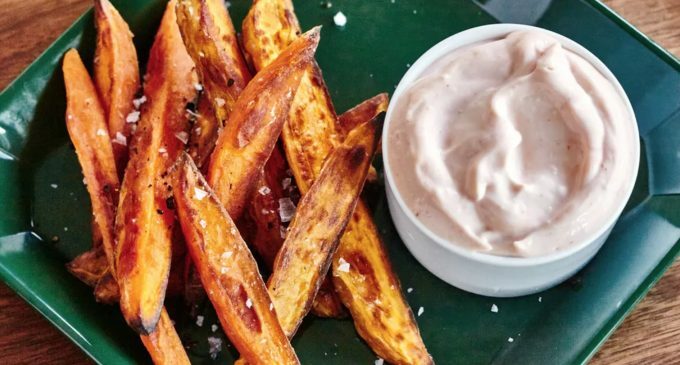 You'll never have to worry about soggy sweet potato fries ever again! We Have Gathered All The Ingredients And The Step By Step Directions To Follow And They Can Be Found On The Next Page.